It’s pure coincidence that I’m posting about Fort Washington on the eve of the 198th anniversary of the Burning of Washington. Not that the fort as it is now was even affected by the incident; in fact, it wasn’t even there at the time. 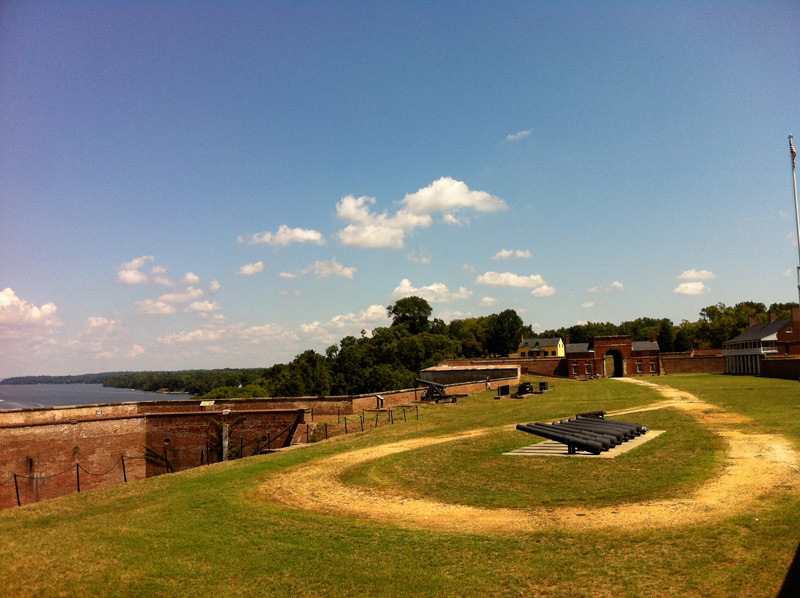 Fort Warburton, which was built to defend Washington, was at that site from 1809-1814. But the day after the attack on the capital, the British headed up the river toward the fort. Rather than fall to the enemy, Warburton was evacuated and destroyed by its own garrison. But when the dust settled, it didn’t take long for a new fort to be constructed, and a decade later in 1824, Fort Washington was complete. Okay, I’m not even going to try to pretend I’m some kind of military history buff. I actually had no clue about any of this until I read about it in the guide I picked up when the kids and I visited Fort Washington recently (and even hope I got that all correct). And, honestly, I wasn’t even aware of the historic site until a park ranger at Oxon Hill Farm mentioned it on a recent visit, suggesting it as an interesting place to bring kids. 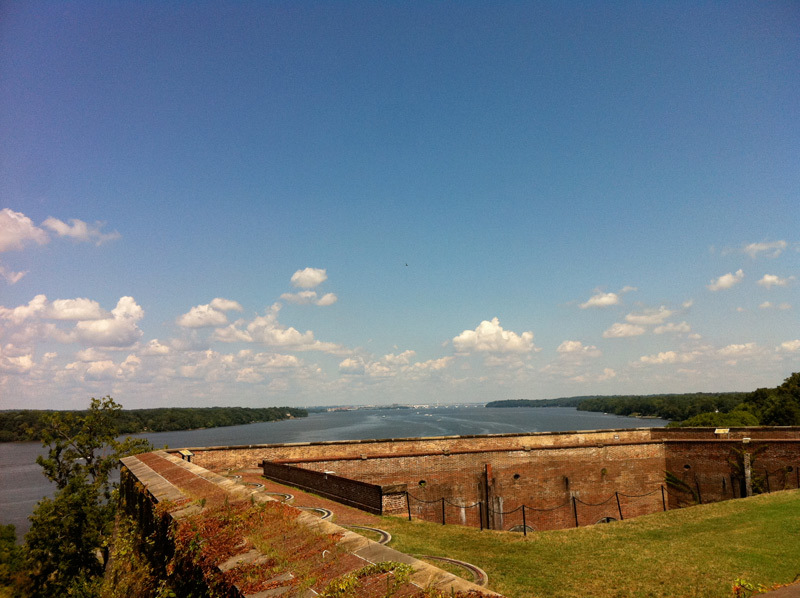 Fort Washington sits on a hill overlooking the Potomac on the river’s Maryland shores. 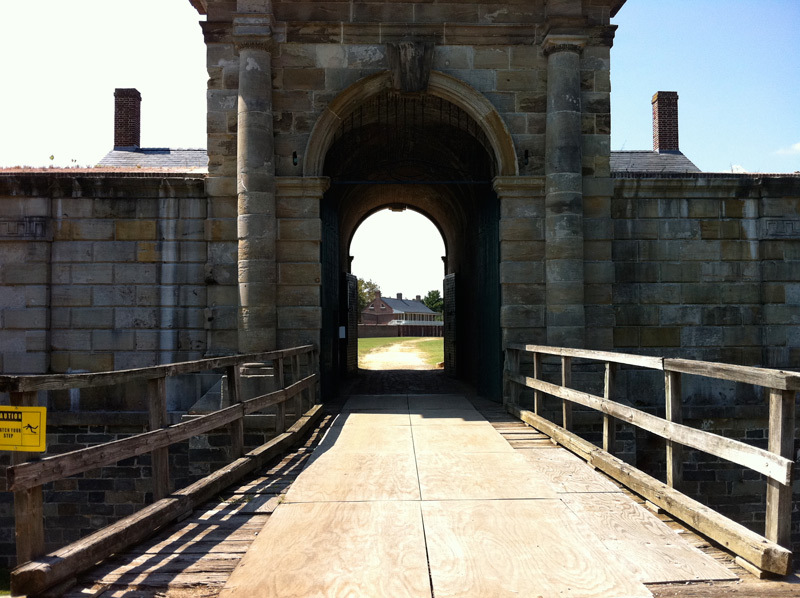 It’s part of the larger Fort Washington Park, and you actually get to it by driving through a gate then a couple minutes along a road in the park before reaching the actual fort. We walked up to it from the lighthouse parking lot, but there is a larger one closer to the Visitor Center. After crossing the drawbridge, we peeked into a couple of rooms in the guardhouse — quarters for guards on duty — then passed through a set of big wooden doors that opened up to a large field just beyond. 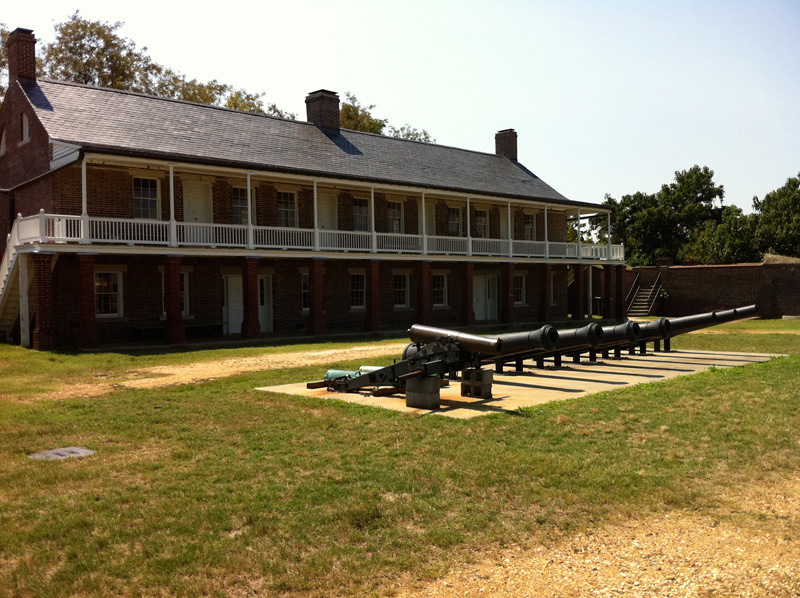 The open grassy space contains several buildings, enlisted barracks and officer quarters, plus some smaller ones for arms storage on one side, a row of cannons in the middle, and one big 24-pounder cannon. The kids were quite intrigued by the historic weaponry. Along the northwest and southwest corners of the fort are bastions with platforms and tracks where guns were rolled over and lined up to shoot over the walls from various angles. The views from those areas are expansive, an obvious advantage for the soldiers back in the day. 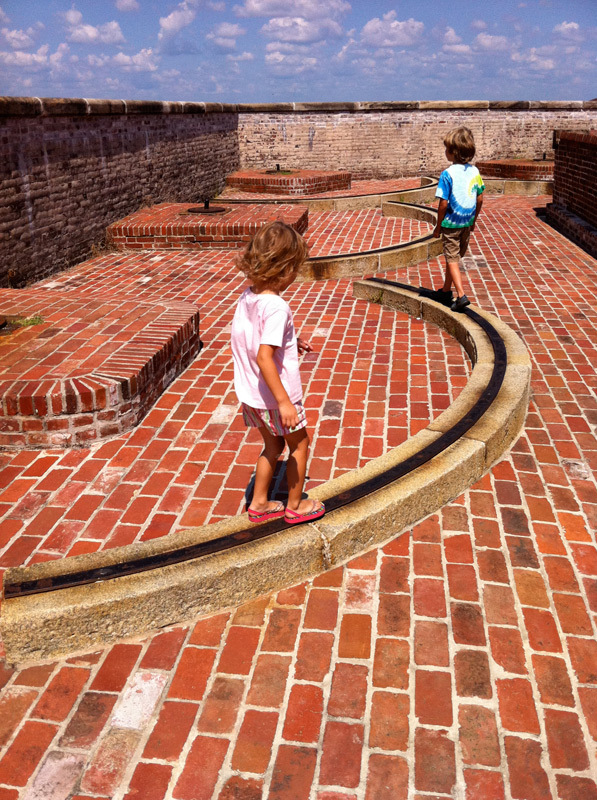 There are some precarious areas within the fort –steep hills and staircases without much of a barrier or railings — so I didn’t let the kids wander too much on their own. 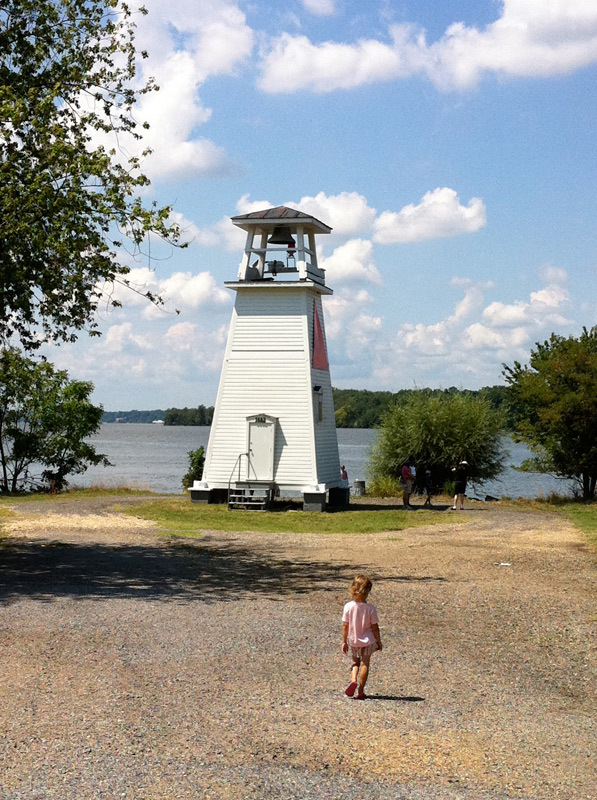 After exploring the main areas and peeking in the windows of the buildings, we headed out and down toward the river to check out the lighthouse. 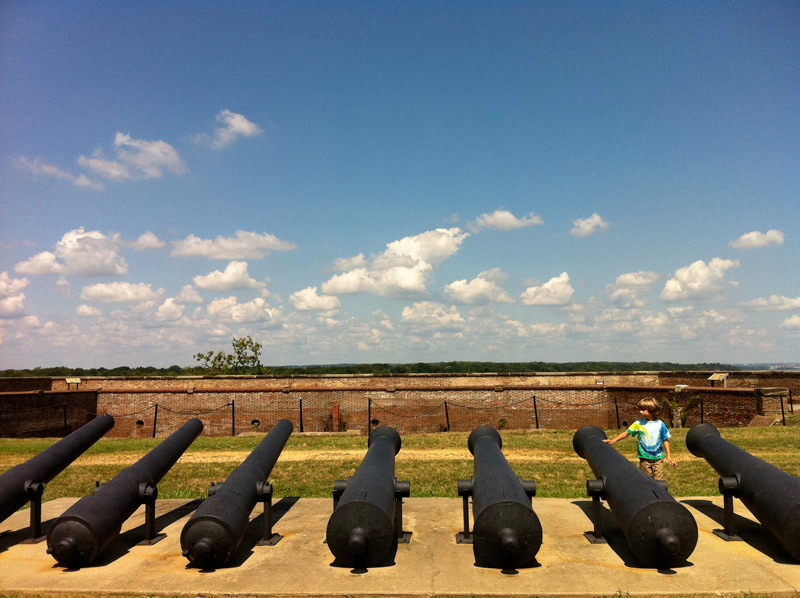 The fort is the main attraction at Fort Washington Park, but there is more to see and do there. A few more historic buildings are in other areas (though we did not visit them) and a trail runs along the river and throughout the park. There are many scenic areas with picnic tables, and we noticed people carrying fishing rods down to the river. Historical reenactments are occasionally held there, and one Sunday per month, the park has Civil War artillery demos. Fort Washington Park is located in Fort Washington, Maryland. The Visitor Center and Historic Fort are open daily 9am – 4:30pm, and park grounds are open 8am – sunset. Admission is $10/vehicle or $3/person. Yes it is truly a hidden gem. My son loves this park because he feels like an explorer. Great post! Thanks, Afenia. 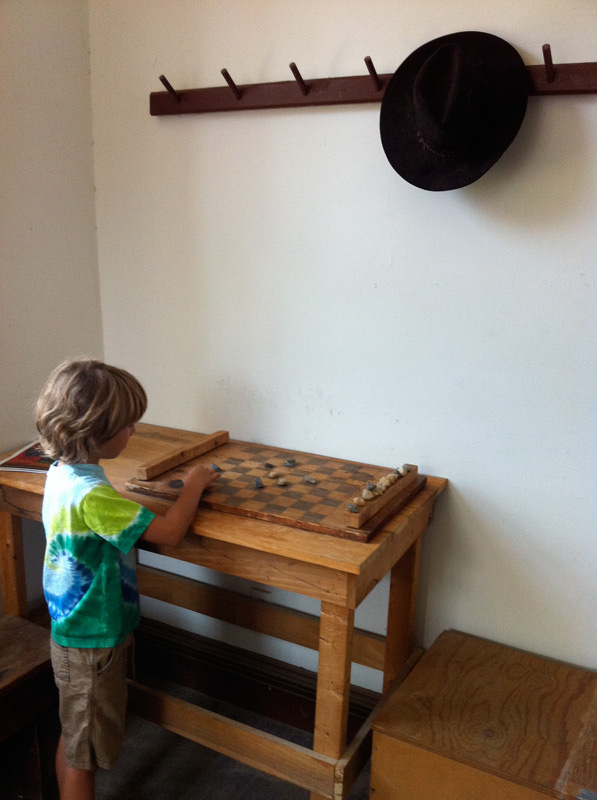 It is definitely one of those places that gives kids a sens of discovery. We’ll be heading back, for sure.